Creating good compost using bedding from poultry houses seems to be an art. For years, I put garden waste, together with the contents of the chicken coop into a heap and wondered why we never seemed to be getting that wonderfully rich crumbly mixture. Monty Don always seemed to have good compost crumbling through his fingers in every gardening program I watched so what was I doing wrong? After spending some time experimenting with different compost bins in different locations around the garden, we seem to have finally found the answer. Compost needs to be kept damp (but not wet) and it needs to have some air through it, it also needs to be mixed well. For example adding a lot of grass cuttings will soon result in a sticky mess but if these are mixed in the bin with wood shavings from the chicken house and kept damp, they will heat up and turn into compost far quicker. I decided to build a double compartment wooden compost bin and after spending far too much money on pressure treated timber from the local wood yard to construct my bin, I found that it was taking nearly a year to compost the contents and even then, there were still many lumps of ‘matter’ that hadn’t composted correctly distributed through the mixture. One problem was location. It didn’t get a lot of sunshine and wasn’t really getting that hot, even though I spent quite a few hours turning and mixing the contents with a fork. Another problem had been size. Even though the bin was large, we soon ran out of room and had to find other places to compost our hen-house manure. The main problem seemed to be keeping the contents moist. Having gaps between the planks meant moisture was evaporating from the sides and the contents would soon dry out. By luck, we discovered the answer to our composting problems. A friend had a spare compost bin that she gave to us – one of those cheap plastic bins that are often supplied free by the council. My first thoughts were that it wasn’t big enough to work efficiently and it had no ventilation holes. I visualised a black slime that would probably end up being the contents of this bin – but how wrong I was! We positioned the bin in the field, in a south-facing position and were glad to have the extra space for a while to put all of the weekly waste in. Within a few days of adding the new contents, the bin was getting hot. So warm in fact that on chilly autumn mornings, I would lift the lid and feel the heat still being generated from the heart of it. The best part was that the contents was rapidly shrinking and every week we opened the lid to add another bucket load and there was room to add it. After only 3 months we were opening the little flap at the bottom and taking a few bucket loads of compost out that Monty Don would have been proud of. I went to my local council office who told me I could buy another bin for £10 which was a real bargain so I bought another 2 bins immediately. 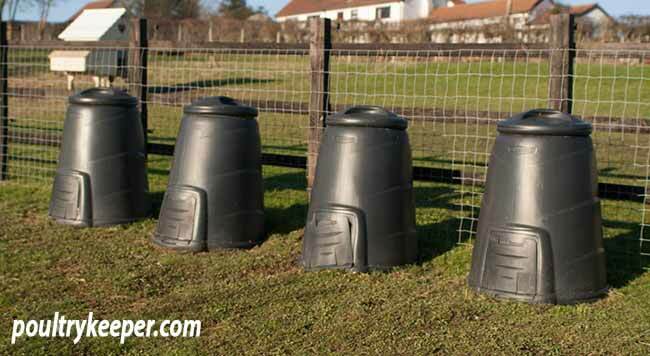 This allows me to distribute garden or poultry house waste equally between them which makes it easier to layer. In between cleaning out the birds, I add a little of our household vegetable waste to each bin weekly which usually ends up very wet and slimy and soon absorbs into the poultry bedding. We mainly use wood shavings and straw in our hen houses. Straw has a big advantage in that it rots down quickly although recently I have been using chopped cardboard as well which composts down quickly too. Mixed with a few grass clippings, the compost bins seem to be kept hot right up until the start of winter. Just a little sunshine seems to get them going again.You can read about the pros and cons of the different kinds of poultry bedding here we’ve tried quite a few over the years. Poultry manure is very high in nitrogen and therefore too rich to be used directly onto the soil. On the compost heap, it is a powerful activator and the straw helps to provide a good texture. This is real satisfaction for me, seeing this waste product now being integrated perfectly into our organic vegetable garden. The finished product is a dark, rich, sweet-smelling crumbly compost that can be used to feed and condition your garden.